Ruby/Sapphire GRIMER emerged from the sludge that settled on a polluted seabed. This POK�MON loves anything filthy. It constantly leaks a horribly germ- infested fluid from all over its body. 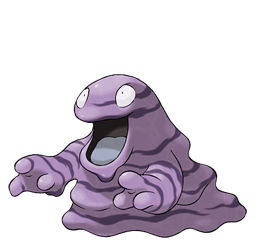 Emerald Born from polluted sludge in the sea, GRIMER�s favorite food is anything filthy. They feed on wastewater pumped out from factories. Leaf Green Appears in filthy areas. It thrives by sucking up polluted sludge that is pumped out of factories. Diamond/Pearl It was born when sludge in a dirty stream was exposed to the moon�s X-rays. It appears among filth. Platinum It was born when sludge in a dirty stream was exposed to the moon�s X-rays. It appears among filth. Heart Gold As it moves, it loses bits of its body, from which new GRIMER emerge. This worsens the stench around it. Soul Silver Wherever GRIMER has passed, so many germs are left behind that no plants will ever grow again. Black It was born when sludge in a dirty stream was exposed to the moon's X-rays. It appears among filth. White It was born when sludge in a dirty stream was exposed to the moon's X-rays. It appears among filth.